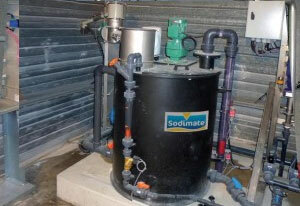 Sodimate tanks are made out of black HDPE, and their design and layout is fully customizable. The tanks come fitted with a mixer, valves, detectors, as well as necessary fittings for pumping, draining, over-flow, and liquid recirculation. 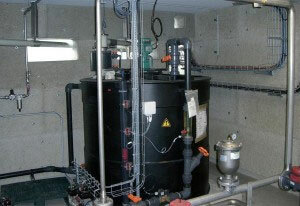 Tanks are dust-free and their volumes typically range from 100gal to 1,000gal. 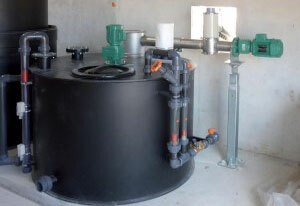 Larger tanks up to 700ft³, made of HDPE, epoxy coated steel, or stainless steel, can also be fabricated. Each tank is designed and calibrated according to each application’s needs (taking into account slurry throughput, concentration, etc) in order to create the best custom solution. 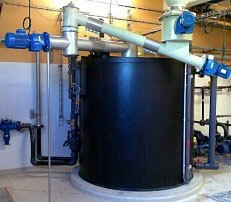 The upstream dry chemical feed system is also calibrated according to these requirements. Homogenizing the slurry, fully wetting each reagent particle, and lowering the overall viscosity through mixing and shearing are all factors that are taken into consideration. We also include anti-vortex structures inside our tanks, which are essential for creating perfectly blended slurries. 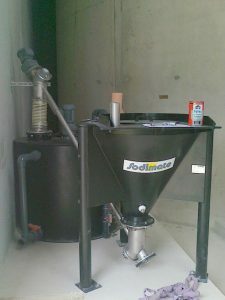 The filtering sleeve system (to which, depending on the application, a dust control spray nozzle assembly can also be added) creates a dust-free unit. Sodimate tanks are widely used in various industrial processes, including water and wastewater treatment, flue gas desulfurization (FGT), soil stabilization, and metal and glass fabrication.